Admittedly, I’ve become a euro gamer. Claiming wooden cubes, placing workers, building massive turns, exploiting opportunities and blocking my friends have become more enjoyable to me than rolling dice in a fantasy setting (Though I’ll still paint an entire army and go to battle in Hordes without hesitation). That being said, there are two major events for those of us that follow gaming. GenCon is the American gaming mecca, ‘the best 4 days in gaming’, for those of us that go, it’s exactly that. Across the pond, there’s Essen the worlds largest gaming convention, which focuses more of the ‘Euro’ aspect of the gaming world. This year saw the release of some of the most anticipated games of the year, Ginkgopolis, The Ladies of Troyes, Terra Mystica, Suburbia and Tzolk’in. Hungry to get my hands on these, I quickly ordered a Essen copy of Terra Mystica, only to have DHS misplace the pallet of games some where in New Jersey. Which left me to wait, the good news was that many game companies were smart enough to push the rest of the games into American distribution as quickly as they could. My FLGS (The Wandering Dragon) ensures that they grab up a copy of every game that they know I’m looking for, just to make sure that I don’t miss anything. 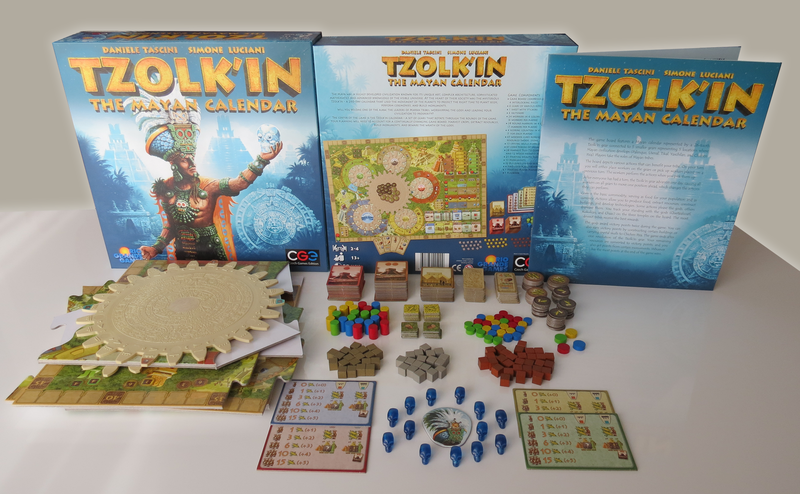 I was excited when they emailed me the other day to let me know that Tzolk’in The Mayan Calendar was in. At it’s core Tzolk’in is a worker placement game. Yes, it’s the game with those awesome moving gears, the mechanic that will move you throughout the board and change what you’re able to do turn after turn. The board is huge, with so many options that it’s a bit overwhelming at first. Don’t let that intimidate you, the rule book is well laid out and explains everything that you need to know perfectly to jump right into your first game without any problems. You’ll start the game with a set amount of workers (boring wooden cylinders for those euro haters) , and as with most worker placement games you can add to the amount of workers that you can place through the game. Though Tzolk’in may be the first worker placement game where maximizing the numbers of workers you have doesn’t always help you win the game. You’ll also get a random amount of resources, food, temple advancements or technology advancements depending on the tiles you choose at the beginning of the game. The game play is fairly simple, you have 2 options, place your workers on a gear, or retrieve your workers. If you’ve played ‘The Manhattan Project’ the actions are similar. To break it down a little more, when placing workers on your turn, you are allowed to place any number you have and possibly pay an amount of corn (our Mayan currency) depending on the amount of workers placed and where you choose to place them. When retrieving workers you pick up any number of workers from the gears and perform the actions. Seems simple right? Place and retrieve. Let’s talk about placing our workers, when placing you must always place on the lowest available open spot. If the 0 space is open, you can not place further up on the track without that space being filled first. Your first worker placement is for the most part always free to place, as in that you don’t have to pay him to go on to the board, though you might have to pay depending on where you place him. If your worker is going into a 0 spot on the board and it’s your first worker it will cost you nothing to place. Tzolk’in works on a pay to place premise. Your first worker is free to place, your second worker costs 1 corn to place, your 3rd worker costs 3 to place, 4th is going to cost you an additional 6 corn to place and so on and so forth. It gets extremely expensive to place your 5th and 6th worker. What happens if the 0 spot is taken on the gear you want? You can place on the next open spot on the gear but have to pay an additional amount of corn equal to price of corn directly in front of the spot. The spots on all of the gears go up to 7 (with the exception of Chichen Itza). So essentially to place your workers, it can cost anywhere from 0 to 7 for your first worker, and drastically increasing throughout the game as you continue to place workers on the board. To pull your worker, you’ll take the worker off of the gear and perform the action that is listed directly in front of it. So you’ll let those guys hang out on the gear until their in front of the action that you’re interested in taking. If for some reason you’re moved past the place that you wanted to take the action on, you can take the action previous by paying an amount of corn for each action further down the gear that you wanted to take. (Ex: You’re on space 5 and actually wanted to take action 4, you take your worker back and pay one corn to take the action on space 4). Everyone will choose their actions around the board, you’ll place or pull any amount of workers you have, or would like to place in turn order, then the next player will do the same, etc, etc. One all players in turn order have placed their workers, you’ll rotate the large center gear exactly one notch counter clockwise. (There’s a way to turn it twice, but we’ll cover that later). The board is broken down into 4 areas, The 5 Gears, the 3 Temple tracks, the Technologies track and the Buildings and Monuments. There are 5 gears on the board where you can place your worker. Yaxchilan is the second gear, it’s essentially where you’ll gather all of the other resources that you need in addition to the wood you’ll get at Palenque. Wood, Stone, Gold and Crystal Skulls area all available on this gear. Again, this gear is pretty straight forward, you’ll leave your worker on the gear and retrieve him when you’re in front of the spot you want. This gear will be a spot of contention for everyone, as you need these resources to build and to use one of the other gears. Uxmal is gear number 4, its the commercial center where you can make offerings to the gods and participate in commercial offerings. The first space allows you to trade 3 corn for an advancement of your choice on the temple tracks. The second spot allows you to exchange corn and resources as many times as you want. The exchange rate is printed on the board for easy reference. The next position on the gear allows you to take one of your additional workers from the reserve. You can build your workers up to 6, though it’ll be costly to place them and feed them. The 4th spot will allow you to construct a building and pay for it with corn instead of resources. You pay 2 corn per resource required for the building. Space 5 allows you to perform one action of your choice on either the Palenque, Yaxchilan, Tikal or Uxmal gear and costs only 1 corn. This spot has created some discussion of it being too overpowered on other sites. Though with the varied options throughout the other gears and the fact that you still have to allow your worker to sit out on the board until it get to space 5, it doesn’t seem to overpowered. It’s either that or we haven’t figured out how to exploit this space properly yet. Finally we have Chichen Itza (Which will always be called Chicken Pizza in our gaming group). Chichen Itza is a place of high importance as it is a quick way to crank out victory points and other resources. To utilize Chichen Itza you must have a crystal skull, there are 13 spots on Chichen Itza and exactly 13 crystal skulls in the game. Each position on the gear may only be used once throughout the game. Feeding time! There are going to be 3 times throughout the game when you must feed your workers as we mentioned earlier. These are split into different times, the first feeding will happen a quarter of the way through the game, when the main gear hits the first brown sticker. Once it hits the ‘Middle of Age’ after taking all of your actions you must feed your workers. Each worker will require a minimum of 2 corn. If you can not feed your workers, you lose 3 victory points for each worker that you can not feed! Once all workers are fed you receive ‘Middle of Age’ rewards depending on your position in the temples. You will receive all resources listed on or below your current position on all temple tracks! This is an easy way to collect resources and prep for the “End of Age’ rewards that will score you victory points. When you hit the blue position on the main gear, it is the end of an age. You will still have to feed your worker at the end of the action phase, but instead of collection resources for your position on the temple tracks you will earn victory points corresponding with your level on the tracks. The highest player on each track will also receive bonus victory points listed above each temple. Remember where I said don’t underestimate the importance of the temple track? It can possibly be a huge game changer when scoring! Let’s take a minute to cover the technology track. There are 4 tracks on the technology section of the board. Agriculture, Resource Extraction, Architecture and Theology. As you gain levels in the technology tracks they’ll provide you will immediate benefits when you take actions on the other wheels. The Agriculture track is going to give you bonuses when you harvest corn on the Palenque gear. The resource Extraction track will allow you to add bonuses every time you harvest a resource from the Yaxchilan gear, and also wood from the Palenque gear. The Architecture track will allow you to gain bonuses when building. Theology will allow you to gain bonuses on the Chichen Itza gear. The abilities on these tracks can be vital to the game and allow you to really optimize decisions you make through the gears. How and when to pull off of the gears is vital to your success in the game. We’re almost there, I promise, just a few more things to cover. What’s left? The Monuments and Buildings. Throughout the game you’ll have an option to build both buildings and monuments. Buildings at the beginning of the game will be first age buildings. As you build, after taking the building action, you are allowed to pay the resources for a building and place it in front of you. These provide you will different abilities and bonuses depending on what you choose to build. I’m not going to cover all of the buildings, as part of the game enjoyment will be discovering how the buildings will work off of each other. There is a building that I want to cover though, they’re the farms. The farms will provide you food for your workers that will subtract from the cost to feed on food days! You can also build Monuments throughout the game, again only when you’ve taken the build monuments action on the board. Monuments will give you end game bonuses and an huge opportunity to crank your victory points. Oh… There’s one more spot I failed to mention. The Starting Player space. It’s located betwen Palenque and Chicken Pizza. If it is unoccupied, it is one of the spaces where you may place your worker. You pay for the worker you place there (if it’s your first worker it’s free). When you place here you get several benefits. Any round when you a player doesn’t take the first player position you’ll place corn on the main gear, when you take the first player position, you’ll gather all of that corn! You also get to immediately take back your worker and it will give you the ability to advance the calendar. When you’re first player you have the option to turn the calendar (main gear) twice but you are only allowed to do it once per game. That is unless you climb to the top of one of the temple tracks, in which you’re allowed to do it a second time! End of Game Scoring, after the fourth food day the game will end. The main gear will have made one full rotation. You will now convert all remaining resources to corn using the exchange rate for the market. You’ll score 1 victory point for every 4 corn that you have remaining. You’ll score an additional 3 victory points for each crystal skull that you have remaining, and finally you’ll score any victory points from the monuments that you’ve built. Final thoughts:Tzolk’in was high on my Essen want list and it definitely didn’t disappoint. There are many strategic decisions that you’ll have to make throughout the game. I’ve been torn between placing workers and retrieving them more than once while playing. I’ve also encountered the issue where I didn’t want to pull any workers off of the board yet but had no more workers to place so I had to choose which worker to pull earlier than I wanted. Tzolk’in offers multiple paths to victory. Do you exploit the Chichen Itza gear, acquire as many crystal skulls as possible and fill those positions? Do you shoot through the ranks of the temple tracks to gain those mid and end game victory points? Do you capitalize on the building aspect of the game, then use a monument to gain additional bonus points for the buildings that you’ve built? It offers so many options that it’s going to be a very difficult game to fully master because you have to choose which way to build an engine for yourself to build points, when doing so you have to also contemplate if by taking that path are you allowing other players to build their own path to victory without difficulty? There are ways to attempt to block out other players from the spots on the gears to ensure it’s more costly for them to place there, but it also involves you placing more workers on a gear which is in turn is also costly. It’s entirely up to you on how you want to play or win the game. With it’s multiple paths to victory, and it’s numerous options throughout the game, I see Tzolk’in making many returns to our gaming table. It’s an easy game to learn, though all of the options may not make it seem like so, but it will be a very difficult game to master. If you’re a Euro fan, this should be high on your list of games to pick up.